Dr. Fung is recognized as one of the world’s leading experts on fasting for weight loss and diabetes reversal, and his work has been featured in outlets such as the Atlantic, the New York Post, Forbes, the Daily Mail, and Fox News. He is the author of several books, including The Complete Guide to Fasting (co-authored with Jimmy Moore) and the bestselling The Obesity Code. 04:03 The Calories notion is false. To determine calories, scientists burn a piece of something and see how much energy is produced from it. Your body does not measure calories and does not respond to it. 100 calories of broccoli is not the same as 100 calories of doughnuts. 13:54 We have a mechanism in our body that determines how fat we get. Your body vigorously defends this set weight. If you get too fat, your body tries to burn off the extra calories until you return to their set weight. If you lose too much weight, your body burns less. In the 1960s no one exercised, but weight was stable in a good range. 17:50 Insulin makes you gain fat. If your fat cells expand to a certain point, they will generate leptin. Leptin goes into the brain and signals that we are too fat and turns down appetite. As you eat less, insulin goes down. 08:29 We now stimulate insulin all day. We went from eating 3 times a day in the 1970s to eating 6 to 10 times a day. This creates insulin resistance. Your fat cells expand and turn on leptin. When leptin is stimulated too often, you develop leptin resistance. 19:39 Your body weight set point is being reset upward. In obesity, there is no lack of leptin, but a lack of response. Your negative feedback loop is broken and you will gain weight. 20:23 To reset your body weight set point, you need to get your insulin low for a significant amount of time in order to get your leptin levels low. The reset of your body weight set point is a balance between insulin and leptin. It is a long term process. 24:14 When you eat all day, you are telling your body to store fat all day and you get fat. 25:07 Fat storage is a hormonal signal, not a caloric signal. You need to let insulin fall. When it falls, your body starts burning body glycogen and body fat. 25:57 Obesity is a time dependent phenomenon. The longer you have it, the harder it is to reverse. 27:05 Over-feeding studies in the 1960s could not make rats over eat. They stopped when they were full. The study shifted to college kids and they couldn’t gain weight. The study shifted to prisoners, who got no exercise, but it was still a challenge to have them gain weight. When the over-feeding ended, they went back to their set weights. 29:41 Intermittent fasting is not about how many calories you eat. It is about the time that you are not eating. When you drop your insulin enough, you tell your body to switch fuel sources. When you eat all the time, you fuel your body on the fuel that is coming in. During a fast, after you have burned through your body’s glycogen stores, you begin to burn fat. 31:24 Insulin inhibits lipolysis, stopping you from burning fat. When you limit caloric intake but your body has no access to fat stores, your metabolic rate slows in order for you to survive. If you are switching fuel sources, your body has no reason to slow down. 32:24 On a 7 day water only fast, your insulin falls and you switch from burning food to burning fat. Since there is plenty of fat to burn, you metabolism does not slow. Your metabolic rate is maintained. 33:13 During fasting, as your insulin falls, you get a counter-regulatory hormone surge, increasing adrenaline, noradrenaline, growth hormone and cortisol. This is done in an effort to get glucose out from the liver into the blood. This pumps up your metabolic rate. 33:53 There is a period of gluconeogenesis at around 24 hours into fasting. When fasting you go to the glycogen stores, chains of glucose stored in your liver. Those last about 24 to 36 hours. You will burn protein, not muscle. Your body targets unneeded or damaged proteins. Growth hormone increases during fasting 3 to 5 fold on a 5 day fast. When you eat again, you will rebuild your lost protein, but it will be robust and healthy. The same goes for autophagy, cancer and Alzheimer’s plaque. 35:40 If the old protein is never broken down, you cannot build new protein. 37:26 You get much better retention of lean mass with an intermittent fasting strategy over cutting calories. 38:24 Biggest Loser style diets sink metabolic rates. If you are not bringing in enough calories and your insulin is still high, you will feel cold and sluggish. Your hair may fall out and your nails may get brittle. Everything takes energy. You are not losing weight. You start gaining weight. 40:40 During the time you fast, your body burns stored food energy. 41:01 When you restrict calories during your restricted eating windows and insulin is low from this intermittent fasting, you allow your body to access stored food energy. 42:15 Women can fast. Ghrelin is the hunger hormone. The higher it is, the hungrier you are. Women have higher ghrelin spikes. 43:01 If you don’t eat over 24 hours ghrelin spikes 3 times, at breakfast, lunch and dinner. Ride the wave of hunger. Hunger does not continue to increase. If you don’t eat, it drops back down. Your body ate lunch out of your own body fat. 45:04 Cravings disappear with fasting and keto. If you have cravings, do not give in. The craving will subside. If you have just a little, it will get worse. Giving up sweets completely is easier than just having a little. This is one of the reasons fasting is so powerful. 49:38 You can eat high carb foods and keep low insulin. Carbs are not the only input into the insulin system. Regional groups of people around the world eat a high percentage of carbs every day, yet they are not obese. They do not eat all day and they eat little sugar. 51:09 Sugar is more fattening than other carbohydrates. Fructose has no insulin effect and no glycemic index effect, but it is bad for you. It is 20 times as fattening as bread. 53:51 Natural foods have natural satiety mechanisms. Highly refined grains have no satiety effect because the fat, protein and fiber, which have satiety mechanisms, are removed. When it is ground fine, you absorb it quickly and it gives you a high. This is why you always have room for desert. 01:01:52 Gastric bypass and gastric banding of the stomach produce the same effect of reducing gut hormones. The effect is from severe, almost fasting, caloric restriction for months at a time. 01:03:36 Dr. Fung created Intensive Dietary Management to support people and get the word out. It has free content and membership guidance. Members can participate in group fasts. Professional support and peer support means a great deal to the success of fasting. 01:08:31 Type 2 diabetes is misunderstood by doctors. They treat blood sugar. Increasing insulin exogenously crams insulin into your liver, which turns it into fat or the sugar is sent throughout the body, including your eyes, legs, heart, nerves and your liver. 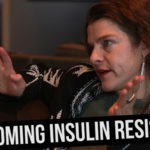 Over decades of using insulin to cram sugar into your body, your body rots. There is so much sugar sitting around, that diabetics get infections easily. 01:10:08 Blood glucose is not the cause of type 2 diabetes. It is the symptom. We treat the symptom, not the disease. 01:11:01 There is too much sugar in the body, in type 2 diabetes. Don’t put more sugar in. Eat a low carbohydrate diet. Burn it off through intermittent fasting. 01:12:15 Type 2 diabetes is reversible, except for the very late stage. If you don’t eat, you burn off your body’s excess sugar. 99% of diabetics are being treated incorrectly. 01:16:42 The longer you’ve been overweight the more it effects weight loss. 01:18:08 There are conflicts of interest in medicine. We pretend to live in the world of evidence based medicine. If the evidence is corrupt, then evidence based medicine is also corrupt. Much evidence is produced by pharmaceutical companies. Universities take funding from industry and produce shoddy research. 01:30:21 Bias in nutrition science is rampant and has stymied the advancement of actual science. Special interest needs to be out of research. Fo you have any concerns with Muscle loss, when using these prolonged fasting periods. . ? Nice question. Personally I find that a 36-48 hour fast once a month is a happy balance to experience the insulin-sensitizing and autophagy benefits while not compromising strength and performance. Going beyond 48 hours for active people may not be needed, necessary. I first heard Dr. Jason Fung just recently on a free webinar series by Ithrive called ‘How to Overcome Type 2 Diabetes and Obesity’. Of all the speakers I was able to listen tolisten to, Dr. Fung fascinated me the most. He advocated an approach I had not heard of before, He made sense, I love his speaking style, he’s funny,, interesting speaker, highly intelligent, practical, uses common sense, passionate about the topic, really cares about his patient’s health and getting to the root of the problem. I bought both his books and am currently reading them. So many nutritionists and drs out there, highly recommend 5 meals a day (to keep blood sugar stabilized) , say fasting is dangerous and will lower your metabolism and you will lose muscle, waste away. So this approach is definitely not the norm, but starting to hear more about it from functional medicine practitioners like Dr. Mercola, Dr. Axe, Dr. Jockers, etc. So I am looking into IF more seriously, started out fasting 16 hrs a day, have lost 6 pounds in a 3 week period, but now am slowing down the weight loss. I’m sure the first couple of pounds lost were primarily water and am now getting into the more resistant fat burning. I’m sure I’m insulant resistant ( but not diabetic nor obese), have carb cravings, even when not hungry, will take time for the cravings to subside. Sometimes I just want to eat out of habit or to fill my stomach, even when I’m not hungry. Hope to increase up to 18 hr fasting a day. My question is when I go 16/8 or 18/6 , should I not eat during the 6 or 8 hr window? Is what’s most important to not eat during the 16 or 18 hr fast? Also, is it ok to eat a small amount of coconut oil when I get hungry, so I don’t end up binging on carbs? Thank so much for this video, was highly informative. Thanks so much, Carolyn! Appreciate the insights. It’s important to not eat during the non-feeding window–which is the main impetus behind time-restricted feeding (TRF). We have a group eCourse going on right now that dives into the specifics of how to do this with recipes and tips as well, you might benefit from. Thanks, Mike. I noticed the webinar is half-way thorough, so will wait and maybe do it next time it is offered. Do you have any suggestions for good books on the Ketogenic diet? That is new for me as well. Thanks for your great interviews. Confused about one thing. If I understand this, during a calorie restriction, the metabolic rate adjusts (goes down) to adjust to the new lower intake of food. Then, often the case is when people start resuming their “normal” amount of food, they gain weight because the metabolic rate is lower then when they started the diet. My question is, wouldn’t, or does, the metabolic rate up regulate to deal with the increased volume of food? If the metabolic rate can be triggered to go down (by eating less food), wouldn’t it be trigger to go back up (when eating more food) again? of infection your body has? Isn’t the case? Great podcast as always! Can someone drop into dangerous levels of blood glucose (they are pre-diabetic state) when they fast or can they just do it like a person with normal blood sugar? Great question–liver health is key for fasting–in both insulin sensitive and pre-diabetics. Because as you mentioned, when blood glucose levels get low, hepatic synthesis of ketones needs to pick up in-order to provide fuel to neurons, astrocytes and other cells. If that doesn’t happen, then many counter-regulatory hormones turn on in an effort to increase gluconeogenesis. Hi Mike–loved this interview. You pulled some really great information out of Dr. Fung that I hadn’t heard before, including your entire discussion regarding the problems with scientific research and conflicts of interest. Always love your podcast, and would be great to hear a bit more on the biophysics side in the future. A Dr. Jack Kruse HIH interview would be epic! Thanks for all the great work you do.